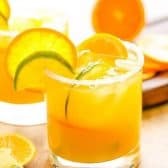 Sweet and tangy, this orange margarita is the perfect sunny day cocktail. If salting the rim of your glasses, run a wedge of lime around each glass and dip in salt. Combine tequila, triple sec, orange juice and lime juice in a cocktail shaker. Shake well and pour over ice.